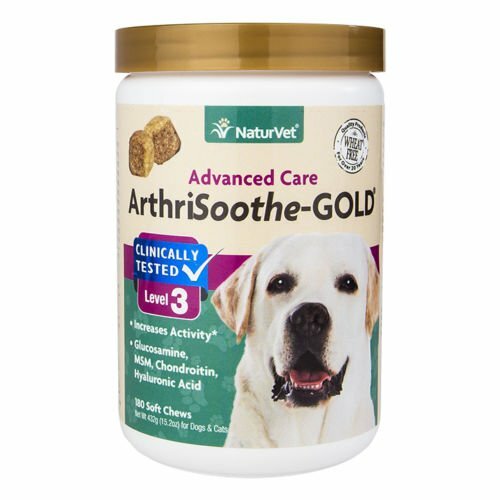 NaturVet ArthriSoothe-GOLD Level 3 Advanced Joint Care Clinically Tested to Increase Activity*. Clinically Tested Formula Provides Support for Pets in Need of Advanced Joint Care, Such as Senior Pets, Those Recovering from Joint Related Injuries or Surgery, or When the Most Support is Needed. Helps Support Synovial Fluid that Lubricates the Joints and to Maintain Cartilage and Connective Tissues. Helps to Maintain Joint Flexibility and Alleviate Aches and Discomfort Associated with Daily Exercise. Wheat Free, Tasty Soft Chews 180ct for Dogs and Cats Over the Age of 12 Weeks. Recommended to Double the Suggested Daily Amount for the First 3 Weeks. Active Ingredients per 3 Soft Chews: Glucosamine, Methylsulfonylmethane (MSM), Chondroitin Sulfate, Green Lipped Mussel, Proprietary Enzyme Blend, Boswellia serrata, Yucca schidigera, Calcium Ascorbate (Vitamin C), Zinc, Hyaluronic Acid and DL-alpha-tocopheryl acetate (Vitamin E). All NaturVet Products are Veterinarian Formulated and Manufactured in the USA in an FDA Audited, cGMP Compliant Facility with a 100% Satisfaction Guarantee. 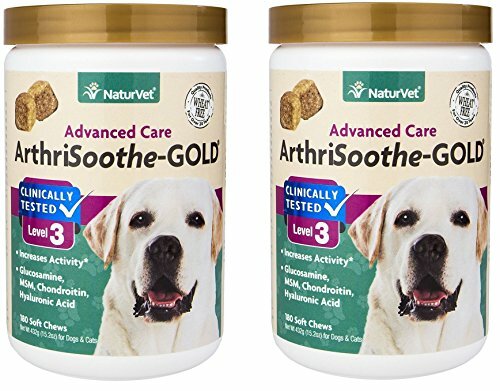 NaturVet ArthriSoothe-GOLD Level 3 Advanced Joint Care Clinically Tested to Increase Activity*. Clinically Tested Formula Provides Support for Pets in Need of Advanced Joint Care, Such as Senior Pets, Those Recovering from Joint Related Injuries or Surgery, or When the Most Support is Needed. Helps Support Synovial Fluid that Lubricates the Joints and to Maintain Cartilage and Connective Tissues. Helps to Maintain Joint Flexibility and Alleviate Aches and Discomfort Associated with Daily Exercise. Chewable, Time Release Tablets 90ct for Dogs and Cats. Recommended to Double the Suggested Daily Amount for the First 3 Weeks. Active Ingredients: Glucosamine, Methylsulfonylmethane (MSM), Chondroitin Sulfate, Green Lipped Mussel, Proprietary Enzyme Blend, Boswellia serrata, Yucca schidigera, Calcium Ascorbate (Vitamin C), Zinc, Hyaluronic Acid and DL-alpha-tocopheryl acetate (Vitamin E). All NaturVet Products are Veterinarian Formulated and Manufactured in the USA in an FDA Audited, cGMP Compliant Facility with a 100% Satisfaction Guarantee. 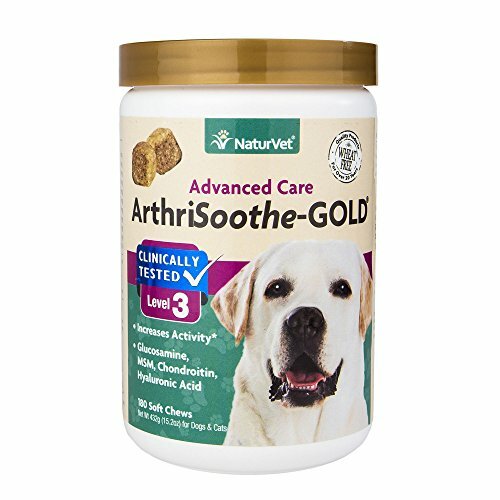 NaturVet ArthriSoothe-GOLD Level 3 Advanced Joint Care Clinically Tested to Increase Activity*. Clinically Tested Formula Provides Support for Pets in Need of Advanced Joint Care, Such as Senior Pets, Those Recovering from Joint Related Injuries or Surgery, or When the Most Support is Needed. Helps Support Synovial Fluid that Lubricates the Joints and to Maintain Cartilage and Connective Tissues. Helps to Maintain Joint Flexibility and Alleviate Aches and Discomfort Associated with Daily Exercise. Chewable, Time Release Tablets 240ct for Dogs and Cats. Recommended to Double the Suggested Daily Amount for the First 3 Weeks. Active Ingredients: Glucosamine, Methylsulfonylmethane (MSM), Chondroitin Sulfate, Green Lipped Mussel, Proprietary Enzyme Blend, Boswellia serrata, Yucca schidigera, Calcium Ascorbate (Vitamin C), Zinc, Hyaluronic Acid and DL-alpha-tocopheryl acetate (Vitamin E). All NaturVet Products are Veterinarian Formulated and Manufactured in the USA in an FDA Audited, cGMP Compliant Facility with a 100% Satisfaction Guarantee. 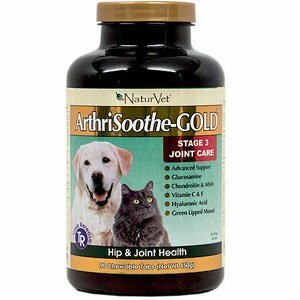 NaturVet ArthriSoothe-GOLD Level 3 Advanced Joint Care Liquid Recommended to Support Healthy Hip and Joint Function. Provides Support for Pets in Need of Advanced Joint Care, Such as Senior Pets, Those Recovering from Joint Related Injuries or Surgery, or When the Most Support is Needed. Helps Support Synovial Fluid that Lubricates the Joints and to Maintain Cartilage and Connective Tissues. Contains Hyaluronic Acid, Glucosamine, Chondroitin and MSM to Help Maintain Joint Flexibility and Alleviate Aches and Discomfort Associated with Daily Exercise. Liquid 16 fl. oz for Dogs and Cats. Shake Well Before Each Use, Recommended to Double the Suggested Daily Amount for the First 3 Weeks. Active Ingredients per 1-½ Teaspoons: Glucosamine, Methylsulfonylmethane (MSM), Chondroitin Sulfate, Boswellia serrata, Yucca schidigera Extract, Hyaluronic Acid and D-alpha-tocopheryl acetate (Vitamin E). All NaturVet Products are Veterinarian Formulated and Manufactured in the USA in an FDA Audited, cGMP Compliant Facility with a 100% Satisfaction Guarantee. 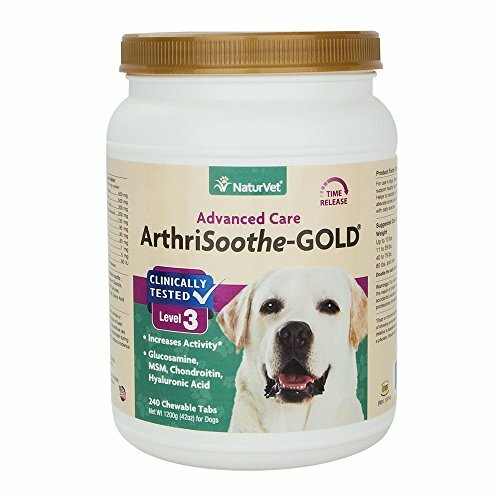 NaturVet ArthriSoothe-GOLD Level 3 Advanced Joint Care Liquid Recommended to Support Healthy Hip and Joint Function. Provides Support for Pets in Need of Advanced Joint Care, Such as Senior Pets, Those Recovering from Joint Related Injuries or Surgery, or When the Most Support is Needed. Helps Support Synovial Fluid that Lubricates the Joints and to Maintain Cartilage and Connective Tissues. Contains Hyaluronic Acid, Glucosamine, Chondroitin and MSM to Help Maintain Joint Flexibility and Alleviate Aches and Discomfort Associated with Daily Exercise. Liquid 32 fl. oz for Dogs and Cats. Shake Well Before Each Use, Recommended to Double the Suggested Daily Amount for the First 3 Weeks. Active Ingredients per 1-½ Teaspoons: Glucosamine, Methylsulfonylmethane (MSM), Chondroitin Sulfate, Boswellia serrata, Yucca schidigera Extract, Hyaluronic Acid and D-alpha-tocopheryl acetate (Vitamin E). All NaturVet Products are Veterinarian Formulated and Manufactured in the USA in an FDA Audited, cGMP Compliant Facility with a 100% Satisfaction Guarantee. Veterinarian formulated and recommended to support healthy hip and joint function. Helps to maintain joint flexibility and alleviate aches and discomfort associated with exercise. AthriSoothe-GOLD helps to support synovial fluid that lubricates the joints and helps maintain cartilage and connective tissue. ArthrSoothe-GOLD contains important antioxidants that help remove free radicals that cause cellular damage. 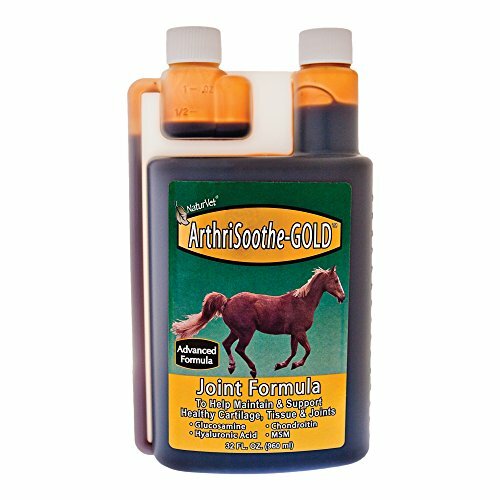 NaturVet ArthriSoothe-GOLD Horse Liquid Advanced Joint Formula to Support Healthy Joint Function and Help Alleviate Aches and Discomfort Associated with Daily Exercise. Contains Glucosamine, Chondroitin, Hyaluronic Acid and MSM to Help Support the Structural Integrity of the Joints and Connective Tissues. Also Contains Important Antioxidants to Help Protect Against Free Radicals that Cause Cellular Damage. Liquid 32oz for use in All Classes of Horses. Shake Well Before Each Use. Recommended to Double the Suggested Daily Amount the First Three Weeks. Active Ingredients per 1 ounce: Glucosamine, Methylsulfonylmethane, Boswellia serrata, Yucca schidigera, Chondroitin Sulfate, Hyaluronic Acid and D-alpha-tocopheryl acetate (Vitamin E). All NaturVet Products are Veterinarian Formulated and Manufactured in the USA in an FDA Audited, cGMP Compliant Facility with a 100% Satisfaction Guarantee. 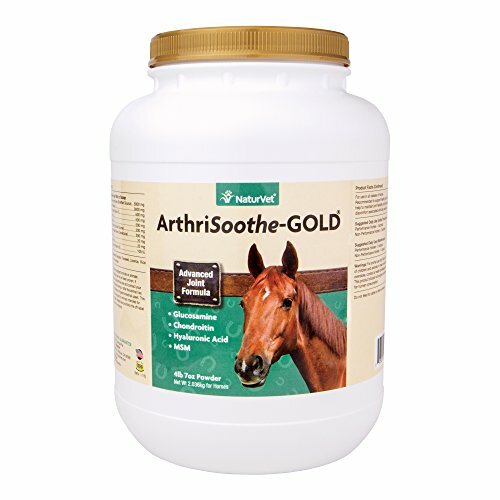 NaturVet ArthriSoothe-GOLD Horse Powder Advanced Joint Formula to Support Healthy Joint Function and Help Alleviate Aches and Discomfort Associated with Daily Exercise. Contains Glucosamine, Chondroitin, Hyaluronic Acid and MSM to Help Support the Structural Integrity of the Joints and Connective Tissues. Also Contains Important Antioxidants to Help Protect Against Free Radicals that Cause Cellular Damage. Tasty Powder 120 Day Supply for Use in all Classes of Horses. Recommended to Double the Suggested Daily Amount the First Three Weeks. Active Ingredients per 29.6 cc Scoop: Glucosamine Hydrochloride, Methylsulfonylmethane, Calcium Ascorbate (Vitamin C), Boswellia Serrata, Yucca Schidigera, Chondroitin Sulfate, Green Lipped Mussel, Hyaluronic Acid, Manganese Sulfate and dl-Alpha Tocopheryl (Vitamin E). Recommended to Double the Suggested Daily Amount During the First Three Weeks. All NaturVet Products are Veterinarian Formulated and Manufactured in the USA in an FDA Audited, cGMP Compliant Facility with a 100% Satisfaction Guarantee. Realizing many pets benefit from joint products at an early age, we have formulated products for each stage of your pet's hip and joint health. Level 1: Maintenance Joint Care, Level 2: Moderate Joint Care, and Level 3: Advanced Joint Care. 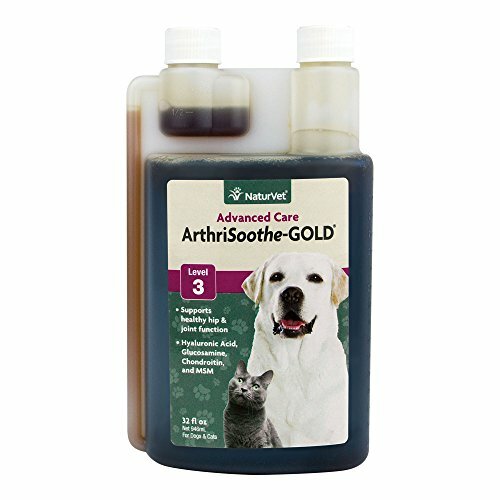 Compare prices on Naturvet Arthrisoothe Gold at ShoppinGent.com – use promo codes and coupons for best offers and deals. Start smart buying with ShoppinGent.com right now and choose your golden price on every purchase.